The Simple Wild was so, so, so good. The begin (not the prologue exactly, but the first two chapters) did immediately have me invested in Calla. The book begins with Calla having just about the worst day possible. This made her relatable which would come in handy later in the book. It took me 20-30% to feel thoroughly hooked. 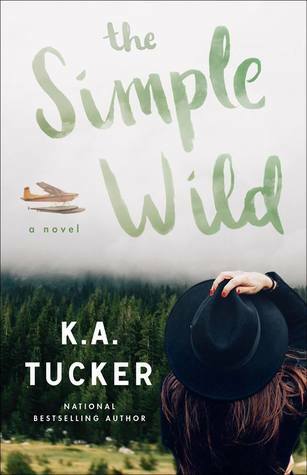 Fortunately, I'm familiar enough with KA Tucker's books that the slow start didn't cause me to slow my pace or put The Simple Wild down. Calla has had an easy life in that she grew up with her mother and stepfather who have a great relationship. Her stepfather has helped her process most of her major life events and emotions as he's a therapist. Her family is well off financially. But Calla's life has not been without pain. Her father has disappointed her time and time again. But when she finally takes that trip to Alaska her world view opens up. Even though she's lived a life of privilege (especially compared to the lives of those in Alaska that she meets), she's open to changing. She's not spoiled exactly. But she's just never had to consider some of the things she encounters while in Alaska before now. And then there's Jonah. He really has a chip on his shoulder where Calla is concerned. He sees her privilege and resents her for it. He also resents that she's taken for granted her father being alive and the time she has left to spend with him. Yet as he gets to know her he realizes that he's been a bit harder on her than she deserves. Yet we see glimpses of Jonah's real personality in the little gestures. I absolutely loved Calla and Jonah's back and forth banter. Their love/hate relationship. I couldn't stop cheesing like an idiot during the clippers scene. Calla's relationship with her father was something else I loved. It really pulled at my heartstrings and I even teared up towards the end. As a parent I'm able to see both sides of relationships like these that previously I just wasn't able to do. -Because no matter how many times I’ve lain in bed, wondering why my father didn’t love me enough, the little girl inside me still desperately wants him to. -How do you form a relationship with someone without forgiving them first? I will say that my one complaint with The Simple Wild was the period of time where Calla doesn't see her relationship with Jonah going anyway, yet she thinks "Letting that happen with Jonah this morning was a bad idea. I don’t regret it—how can I regret anything that felt that good?—but it can’t lead anywhere, so what’s the point?" I hate this line of thinking. The "it feels so right, how can it be wrong" attitude. Quite frankly, there are tons of things in life that might feel very good in the moment but are not good for us at all. And we can't succumb to the feel goods of the moment to the detriment of what is actually right. All of that being said, The Simple Wild gets 4 stars. I loved the characters, the setting, the relationships, the lessons and story... all of it added up to a wonderfully enjoyable experience. I texted my sister right before I finished and told her to add this one to her list as soon as she can. Have you read The Simple Wild ? What did you think? Let me know! I have seen Tucker's name around, but I don't think I have read any of her work. I love when a book grabs me quick and I become invested in the characters well being. I've really enjoyed all of her books. It definitely helps to feel invested quickly. I hope you get to read something by her soon. Thanks for stopping by Sherry!